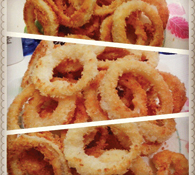 Thanks to Mama Mel Jaranilla for the onions she gave us, I was inspired to look for a yummy onion rings recipe; as requested by my husband. 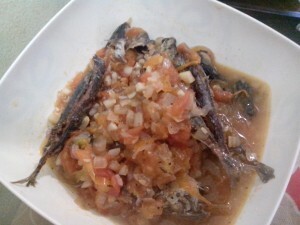 Because of the satisfaction it has given to our family’s tummy and taste buds, I want to also share our experience. Having this recipe is like having a pro made your onion rings! Cut the onions in slices. Make sure to cut them in circles, then set aside. Prepare 3 bowls. In one bowl, mix the flour and salt. In the next bowl, whisk the milk and egg together. And in the 3rd bowl, put in the breadcrumbs. While preparing the rings, also prepare the oil in a pan and heat it. Make sure the oil is hot before you put in the onion rings. When the onion rings are slightly brown/golden brown, take them out already. 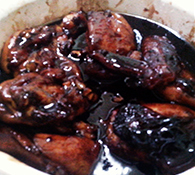 Then put them in plate with tissue paper to remove the excess oil from it. This is also best with a dip. The simplest dip you can have is mayo with garlic powder, mayo and ketchup or even just mayo. Sounds yummy??? Try it now and give me a feedback on your experience. Hehehe… ENJOY!!!! !